Another work birthday, another amazing dessert. 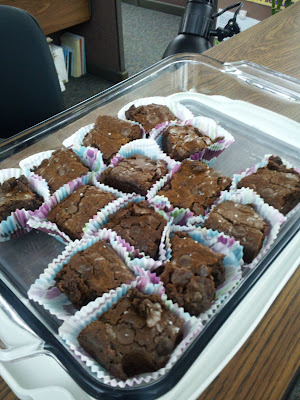 There weren't any leftovers of these bad boys by the end of the day and I was told that they were the perfect brownies. And what's not to love? There's butter, eggs, dark chocolate and sea salt. All my favorite flavors. Whisk together the flour, salt and cocoa powder and set aside. In a saucepan, combine the butter, coffee powder and chocolate over low heat until melted and smooth. Remove from the heat and allow to cool slightly. Combine the sugars, then whisk into the melted chocolate/butter combo. Add three of the eggs and whisk in gently before adding the remaining two eggs and the vanilla. Switch over to a rubber spatula and sprinkle the dry ingredients over the chocolate and eggs. Fold gently until just combined, then pour into a 9x13 pan that's oiled and lined with parchment. Sprinkle the chocolate chips over the batter, then dust with the sea salt. Bake at 350 degrees for about 35 minutes. A toothpick should come out mostly clean. Allow to cool in the pan before removing using the parchment paper, then slice into squares.